Minneapolis-based artist Ginny Herzog has been an invaluable Ampersand enthusiast for many years. This past year at NAMTA in Minneapolis, we were honored to have Ginny in our booth demonstrating her work on Ampersand panels. 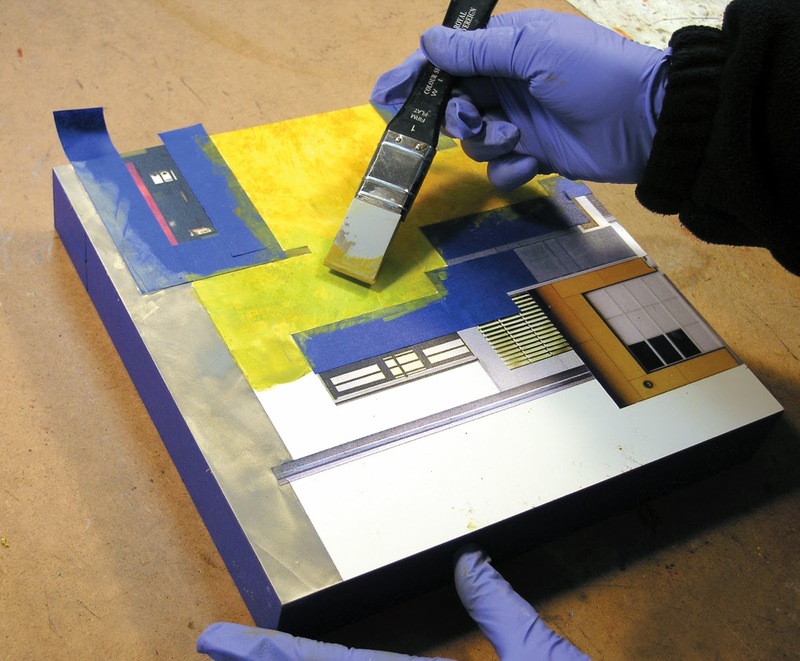 Ginny shares with us her mixed media work process on Encausticbord™. 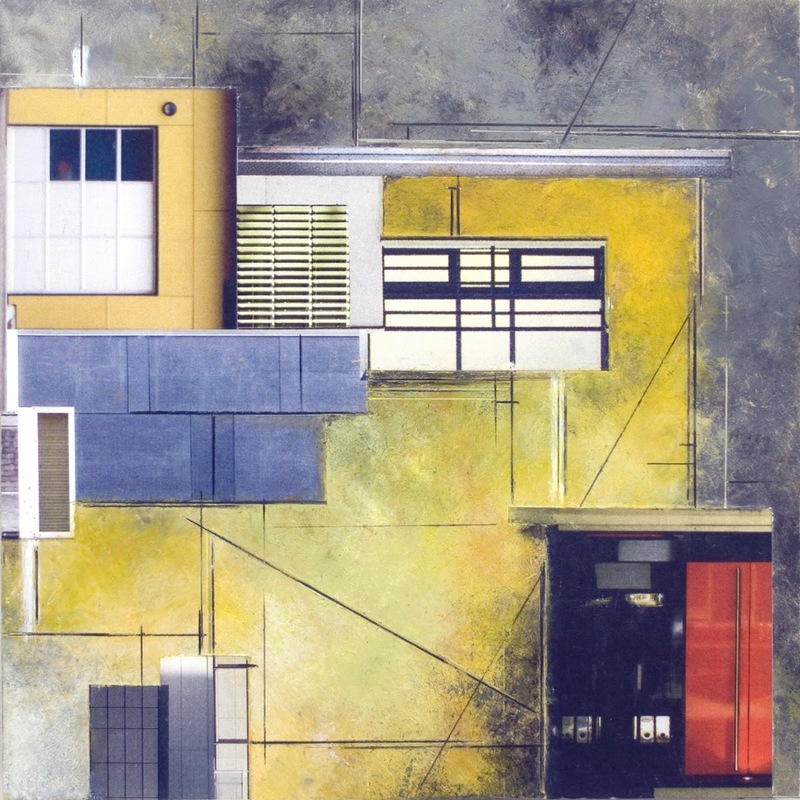 I have been using Ampersand’s panels for my mixed media paintings since they first came on the market in 1994. Until recently, I worked mainly in watercolor and collage on the Aquabord™. But over the past several months, I have fallen in love with a new medium: Daniel Smith oils mixed with Dorland’s (cold) Wax Medium. I practiced my first attempts on Aquabord™ and Gessobord™, but found that the new Ampersand Encausticbord™ was a more outstanding surface for my new medium especially since it is tailor-made for wax, oils, collage and mixed media. It provides me with a rigid, smooth and consistent, archival surface that withstands the abuse of various methods that I use to achieve my textural effects. with Daniel® Smith’s acrylic gel medium. First, I take digital photos of architecture, both interiors and exteriors, manipulate them in Photoshop®, frequently eliminating objects or distorting the context of the original image. 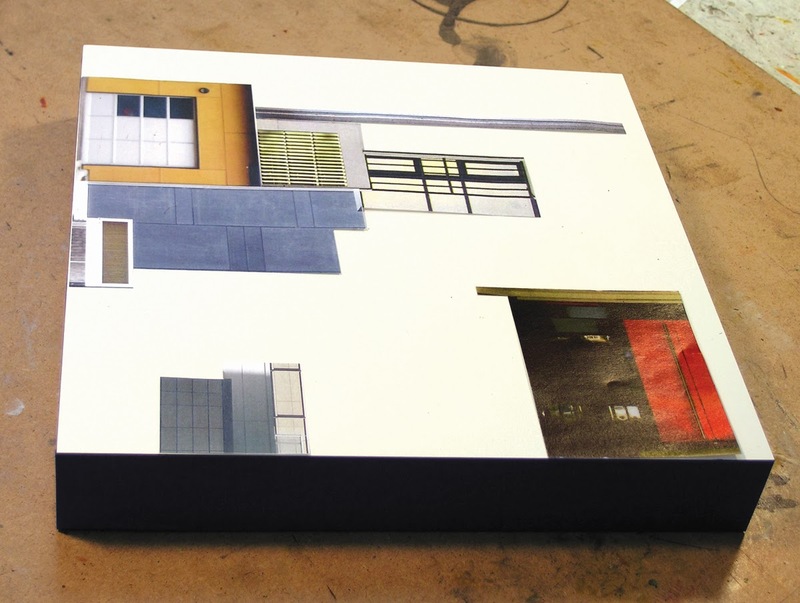 I print the photos on archival laser color paper and then use the prints as collage elements in my paintings. wax medium using the Colour Shaper® tool. I collage my photos onto the panel with Daniel Smith Ultimate Acrylic Medium (matte) by brushing it onto the back side of the photo copy with an old flat paintbrush, then placing it onto the panel and rolling over it with a rubber brayer to make sure it has adhered completely to the panel and that there are no air bubbles. up plastic wrap to get this soft textural effect. Next, using Artist’s Masking Tape, I mask out the edges of the photo collage that I want to protect from the oil paint. I apply Daniel Smith Oils mixed with the Dorland’s Wax Medium using tools such as palette knives, Colour Shapers (shown) or dough scrapers. After a few applications of the paint and cold wax, I remove the artist’s masking tape so that successive layers of paint blend well around the crisp paper edges of the collage. 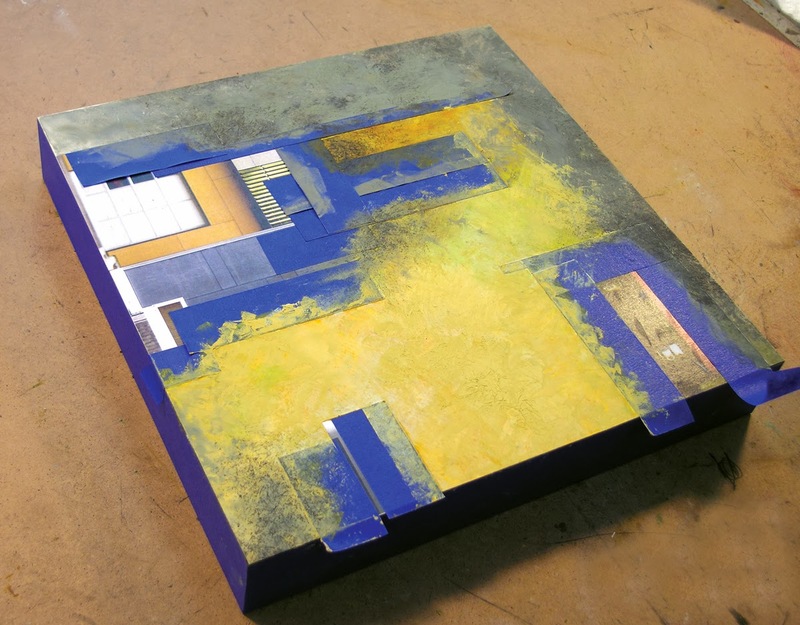 The wax medium also enables me to build up more textures by blotting the painted surface with plastic wrap (example shown in yellow areas), papers or other textural materials in an additive method, as well as gouging, scraping and using odorless thinner in a subtractive method. 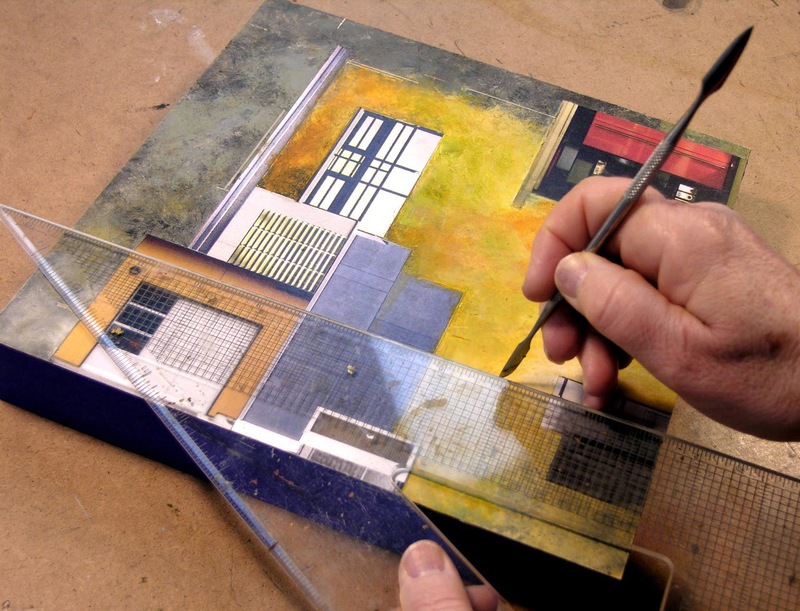 I frequently include architectural references as the painting begins to dry, adding linear detail by drawing into the painted surface with dental carving tools, oil sticks and Derwent® Inktense pencils. It’s nice how cold wax paintings dry and cure faster than pure oil paintings and that I can use polishing cloths to buff the painting when it is dry. I use both the flat and cradled panels. Generally, I apply three coats of ebony Minwax® stain to the cradle with a foam brush, wiping between coats and finally buffing after the last coat. knowledge, so it’s good to read this webpage, and I used to visit this website everyday.